Earlier this year Harley-Davidson introduced its latest power cruiser, the FXDR 114. Named for its big Milwaukee-Eight 114 engine, the FXDR much more modern, sporty styling than a traditional Harley. This type of styling is more appealing to younger riders than Harley's classic looks and typical miles of chrome doo-dads. What lies under the skin of this more modern looking Harley? "We touched almost everything you can see, touch or feel," says Harley. That's true since the FXDR 114 bears virtually no resemblance to other bikes sharing its Softail platform. The bodywork is fresh, with small windscreen, a short tail section with a removable cowl, and unique side covers, front fender, and a chin spoiler. The aluminum wheels are unique to the FXDR, with a 19-inch “Ace” front wheel with 5 pairs of thin spokes and a lightweight 18-by-8 solid disk in the rear. It features LED lighting, with a unique taillight attached to the aluminum swingarm with its own single aluminum mount. This Harley uses clip-on handlebars and a digital gauge cluster. The Milwaukee-Eight engine features a forward facing intake inspired by drag bikes with an oil-free exposed filter. The exhaust is a unique two-into-one system with a modern look that integrates the catalytic converter. Together, this generates 119 pound-feet of torque at 3,500 rpm in its configuration for the U.S. and Canada. 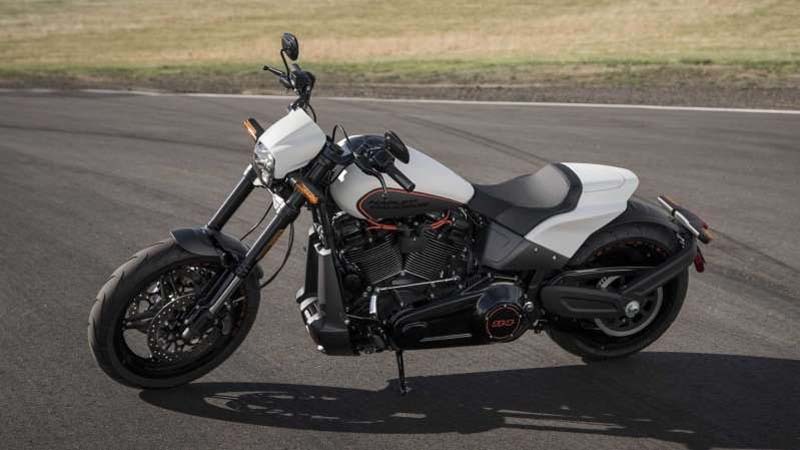 Harley doesn't list a horsepower rating, which seems a bit of an omission for a power cruiser, but the Fat Bob's 114 makes 82.3 horsepower, so the FXDR is probably similar. Harley has also tweaked the suspension geometry a bit. The new cast aluminum swingarm adds a half-inch offset in rear shock mounting point to provide the superior handling of a long shock in a small package that fits under the FXDR's skin. The front suspension features inverted forks with single-cartridge damping and triple-rate spring. Harley has set the frame in a slightly higher plane to enable steeper lean angles of 32.6 and 32.8 degrees, the most of any Softail-based bike. Look a bit deeper, though, and it becomes clear that despite some unique parts, the FXDR is still very much a parts-bin special. The inverted forks are modified from the forks on the FXFB and FLSB. The headlight comes from the Breakout, and the turn signals from the Deluxe. 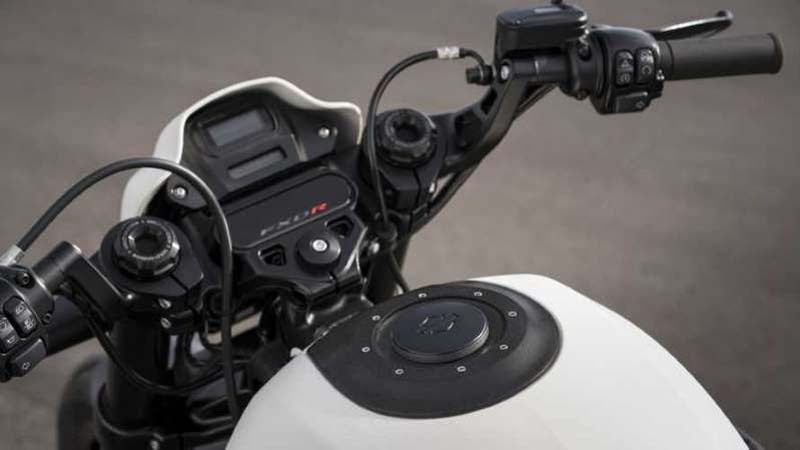 The digital gauge cluster is also from the Breakout, as well as the Street Bob. The Milwaukee-Twin 114 engine has no internal changes for the FXDR, so like other Harleys, it favors low-end torque over high-end horsepower. Also, let's face it, you know that Harlistas will ditch that fancy-pants exhaust and header in favor of louder aftermarket exhausts as soon as they can. Is being a parts-bin special such a bad thing? Eh, not really, especially since this bike is more than just a Breakout with different bodywork. Sure, it uses a bunch of parts from other bikes, but the combination of parts is unique to the FXDR 114 and gives it a distinctive look. There are also enough design and minor geometry changes, as well as weight reduction, to properly call the FXDR 114 a unique model. Will it attract the much-vaunted Youths? That remains to be seen, but it's definitely a step in the right direction.